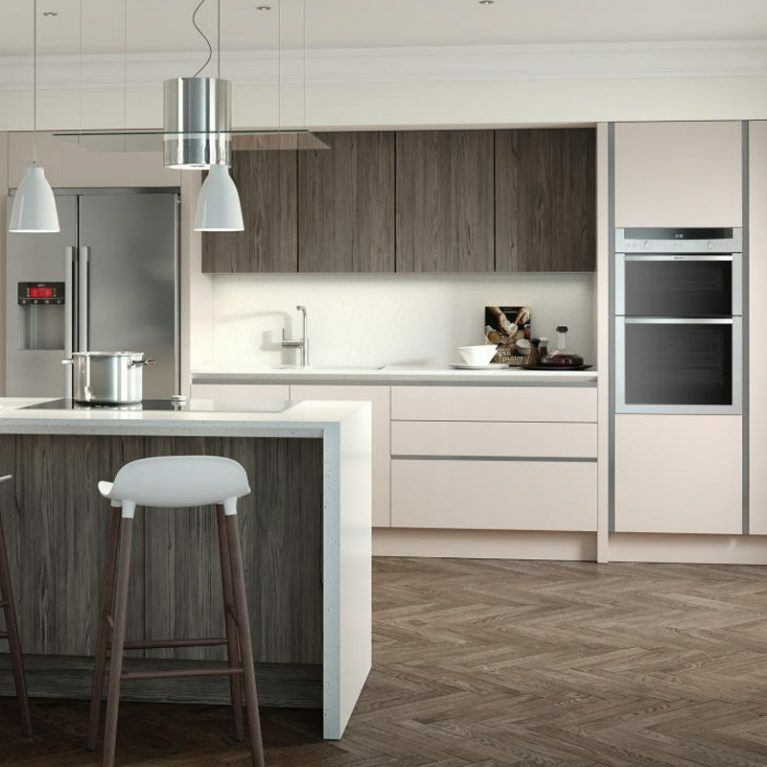 Kitchen designs don’t get much more clean than the Milbourne Oak, one of Number One Kitchens’ remarkable contemporary kitchens. 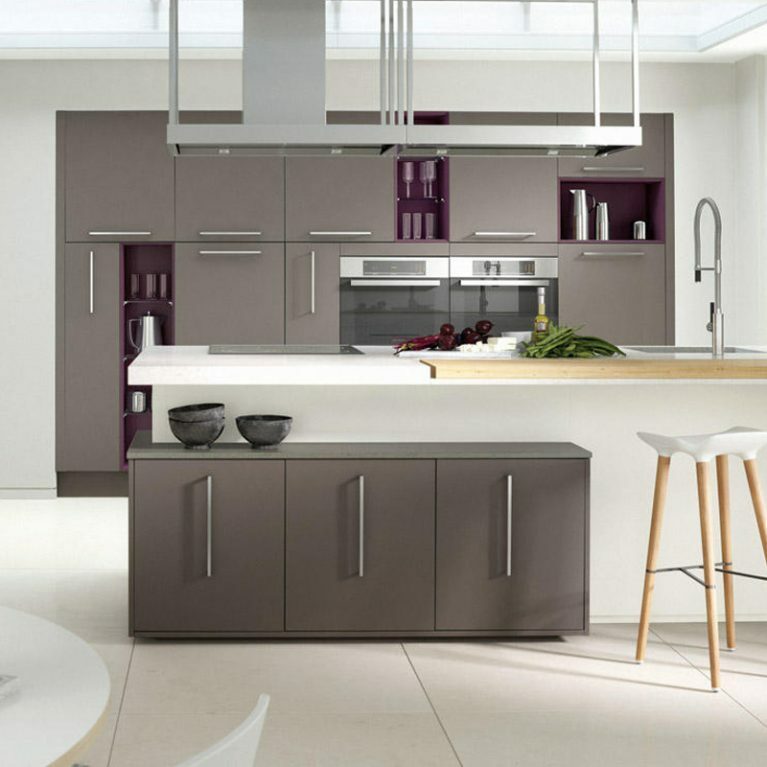 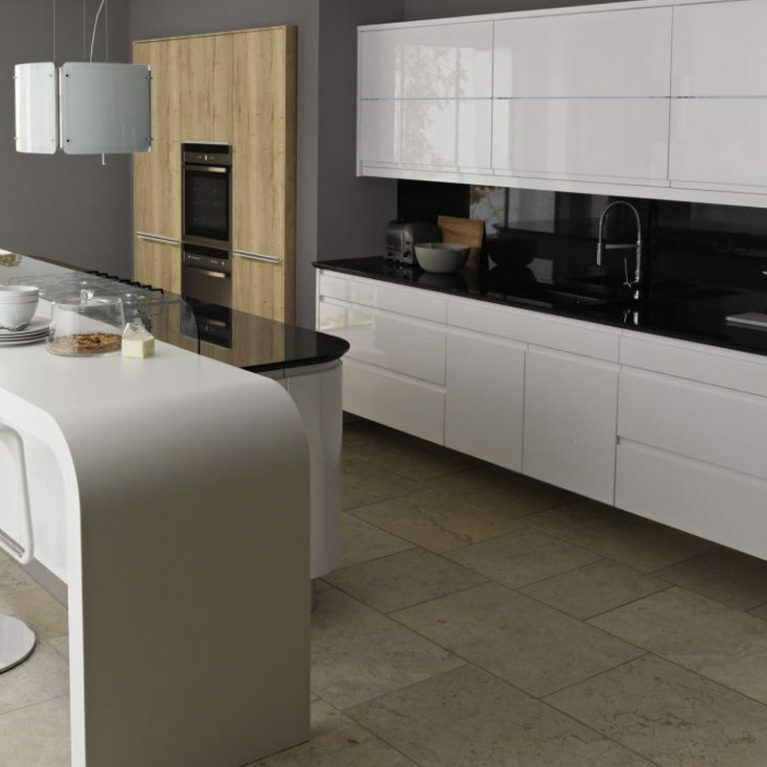 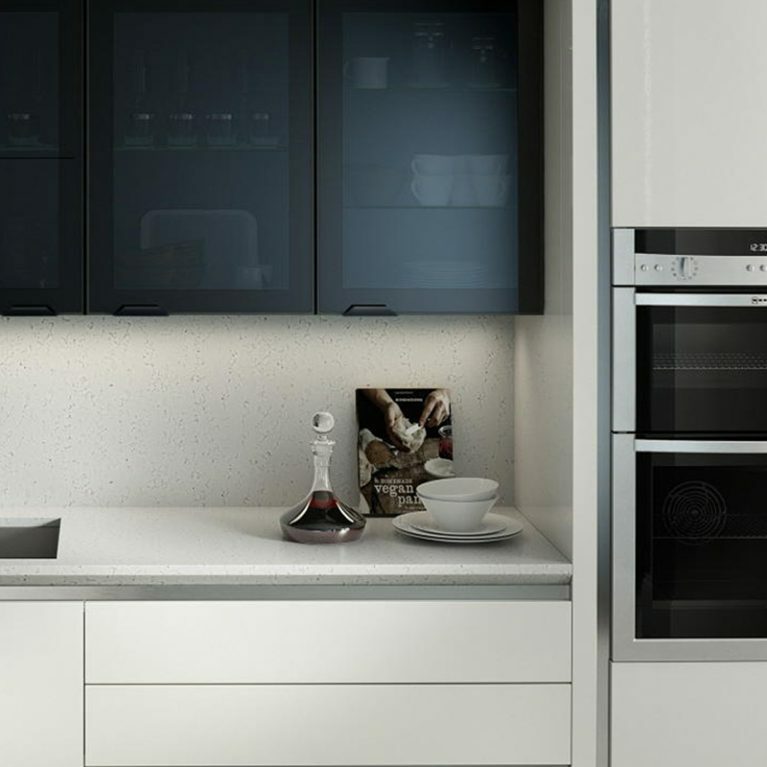 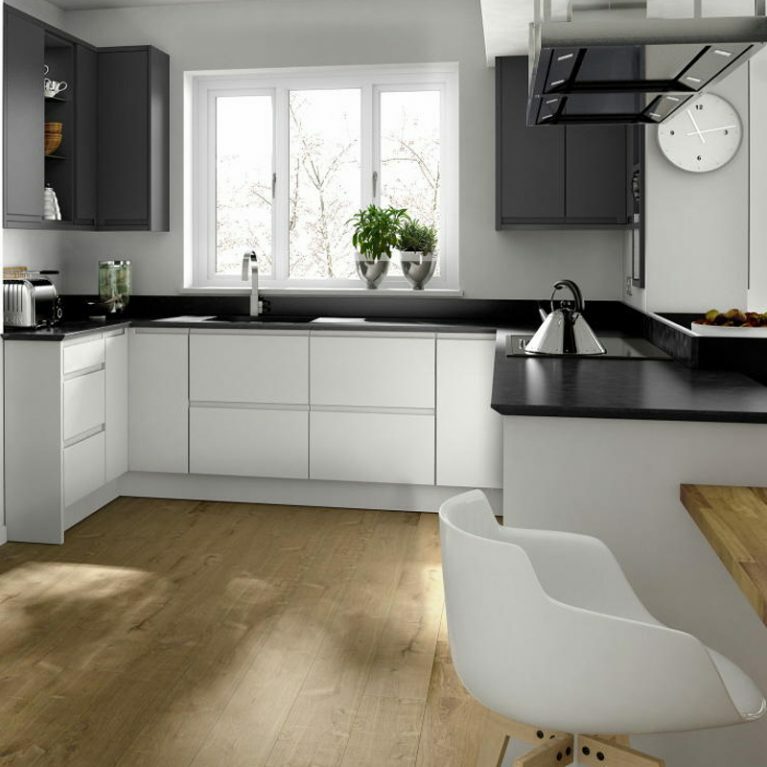 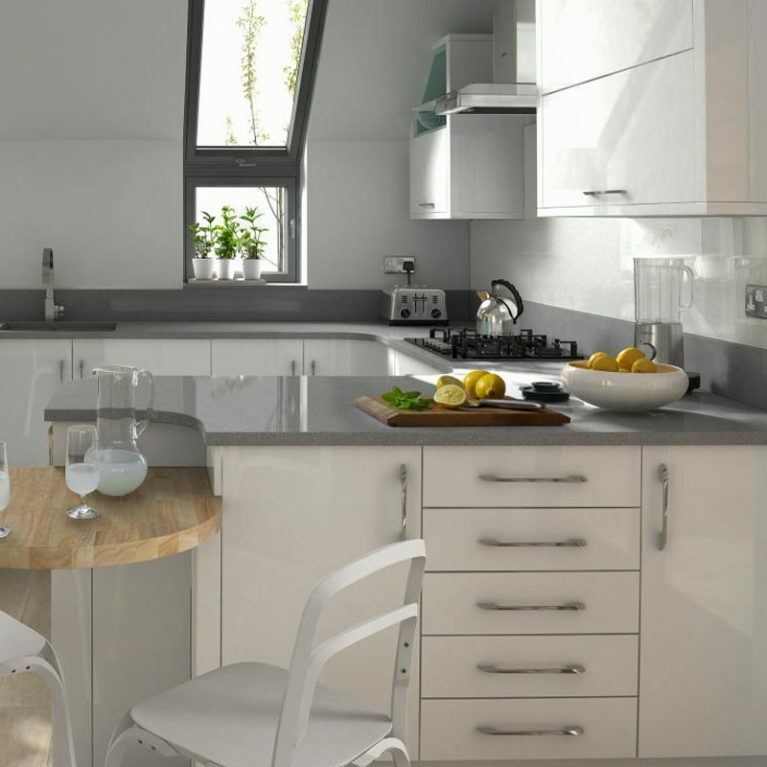 This crisp and sleek kitchen creates a striking look and feel for the heart of your home. 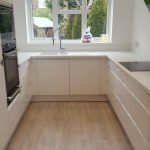 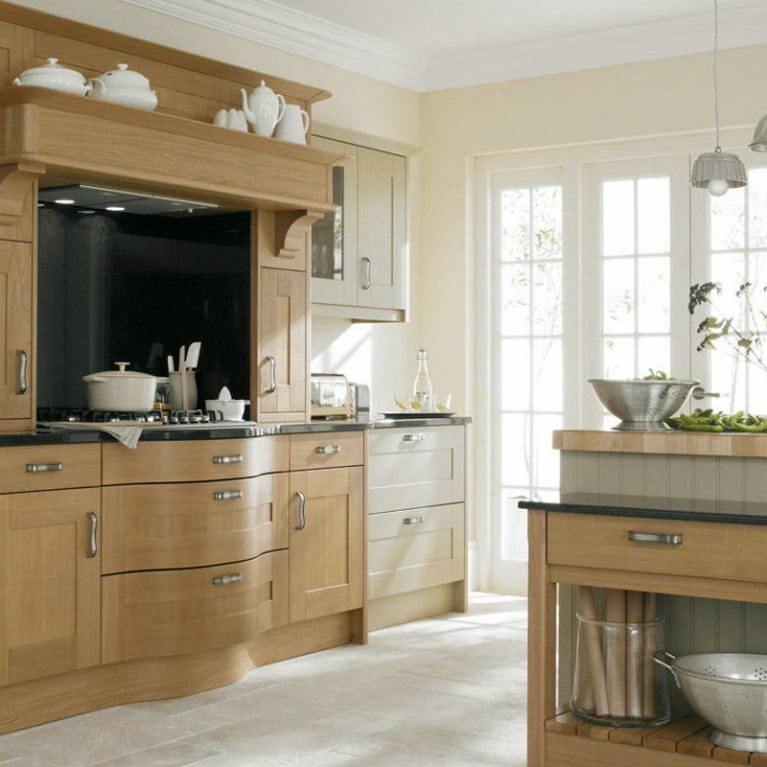 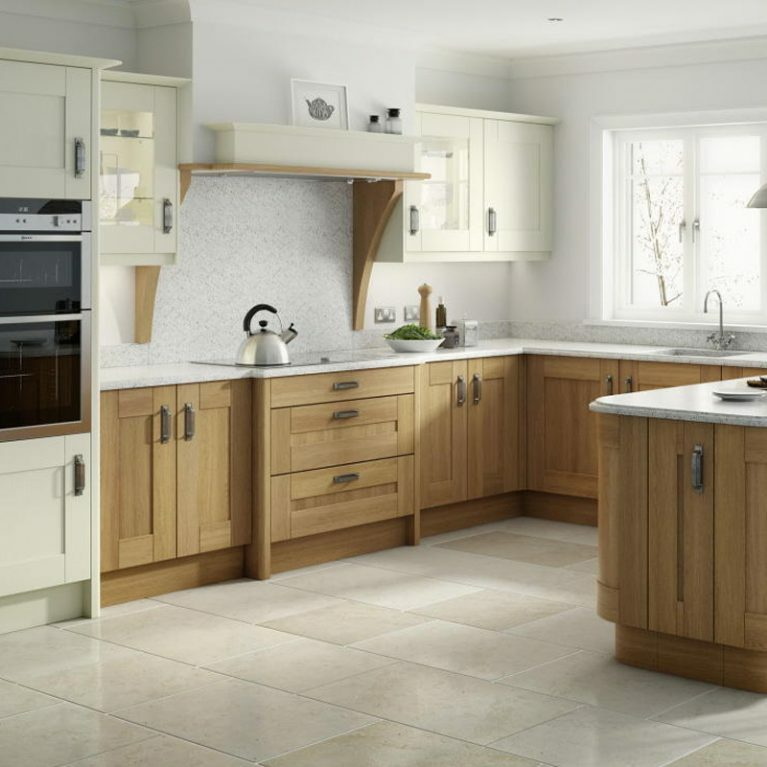 Not only is the Milbourne Oak classic curved wood kitchen a sight for sore eyes, but it’s an incredibly practical and durable kitchen solution too, promising to stand the test of time and retain its perfection for many years to come. 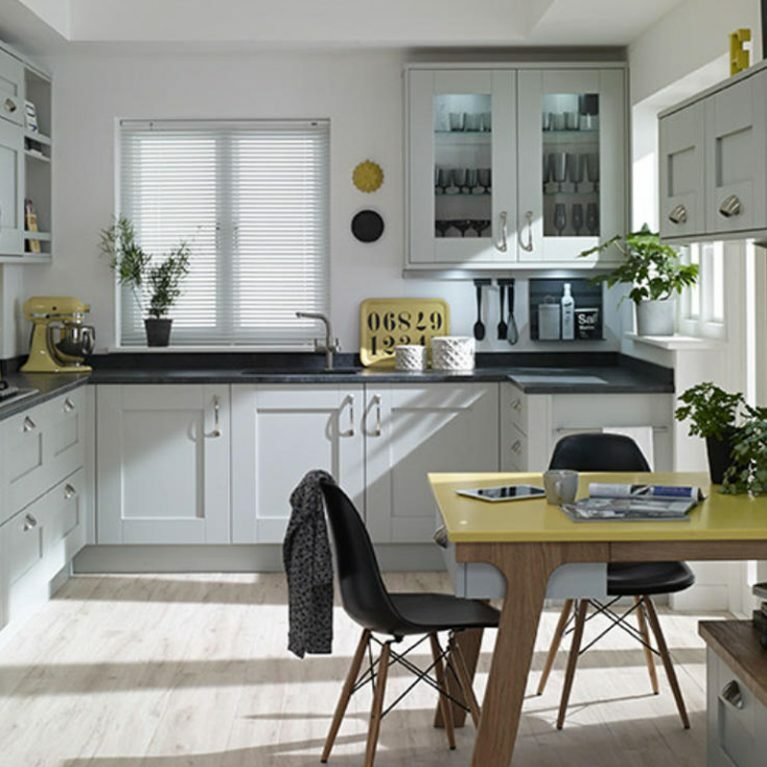 The effortlessly cool shaker style kitchen design truly makes the most of your kitchen, creating a wonderfully spacious look with seemingly endless storage opportunities. 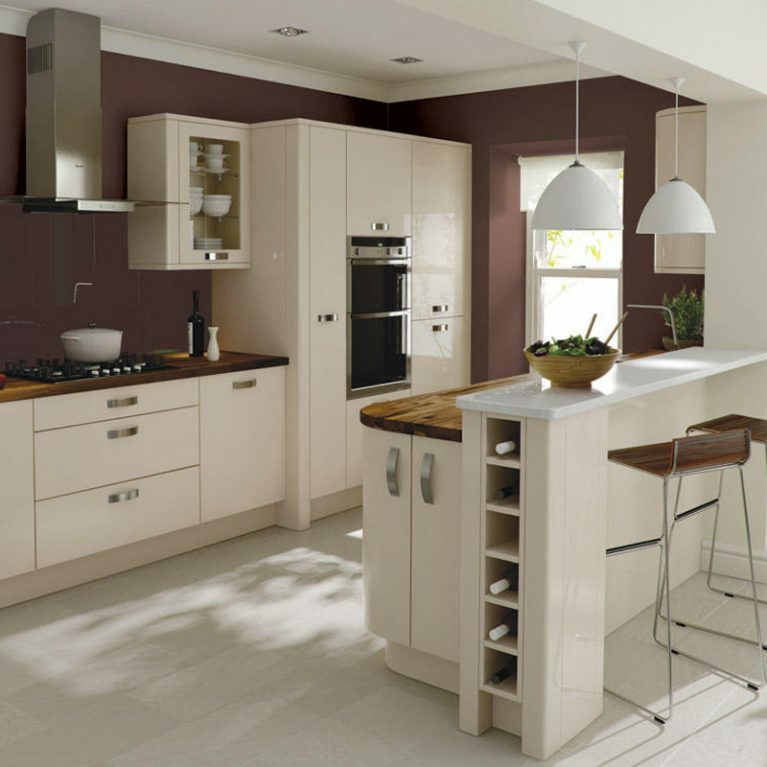 The wooden upper and lower cupboards line the back walls of your kitchen, creating a wonderful open plan design. 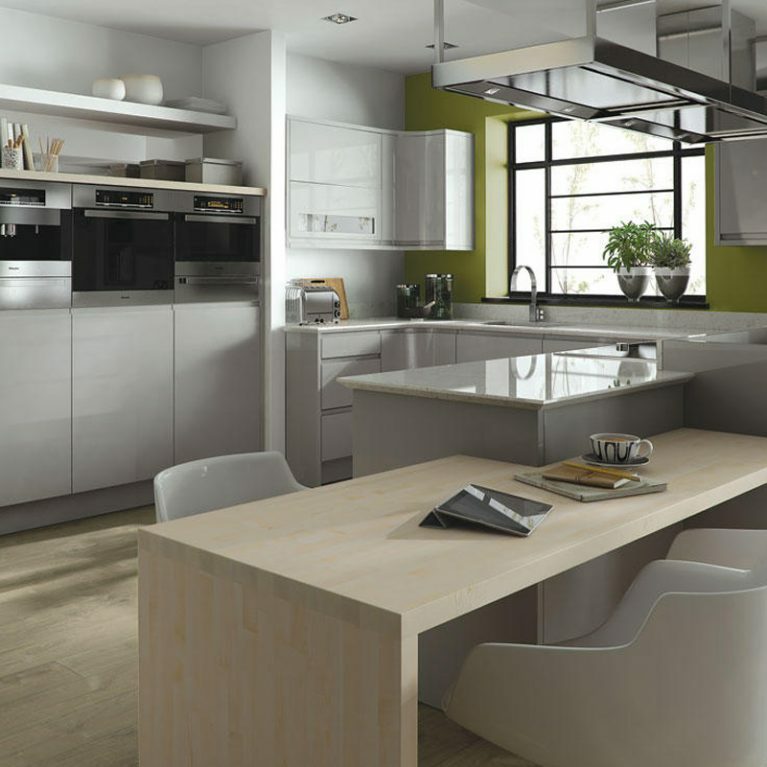 In the centre, there’s a gorgeous kitchen island which creates ample space for food preparation and entertaining. 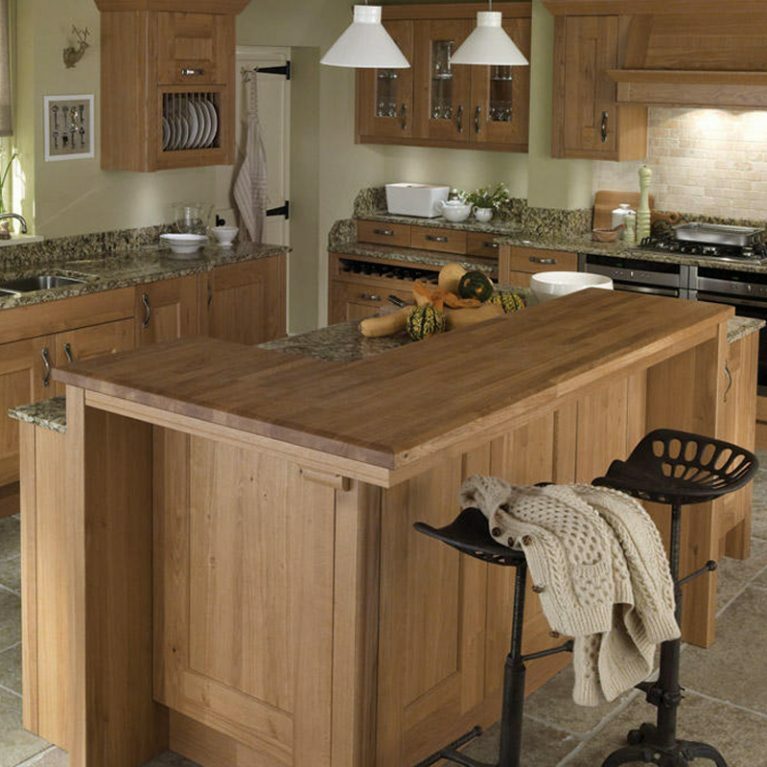 Oak is a stunning and versatile shade for the kitchen. 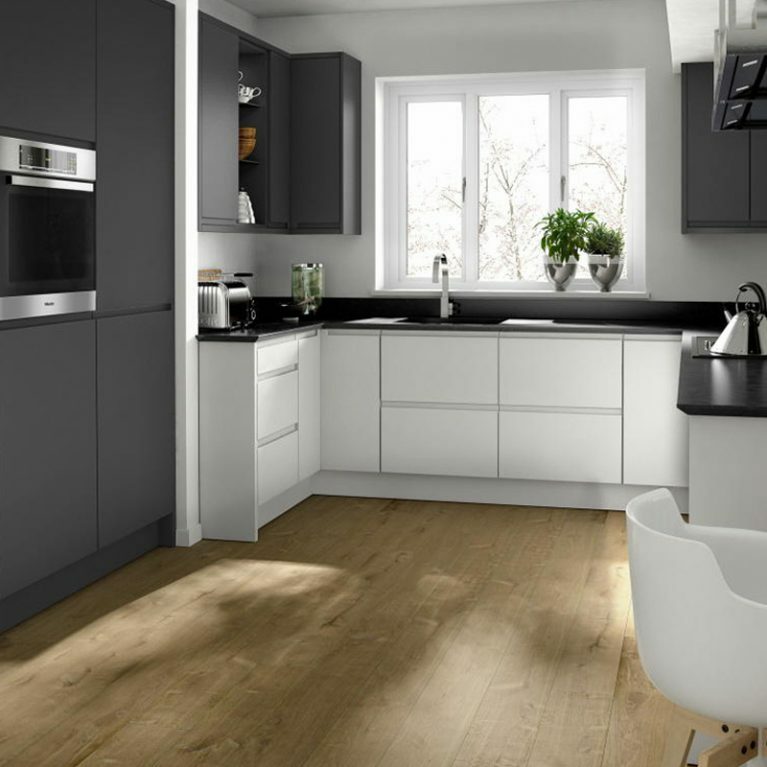 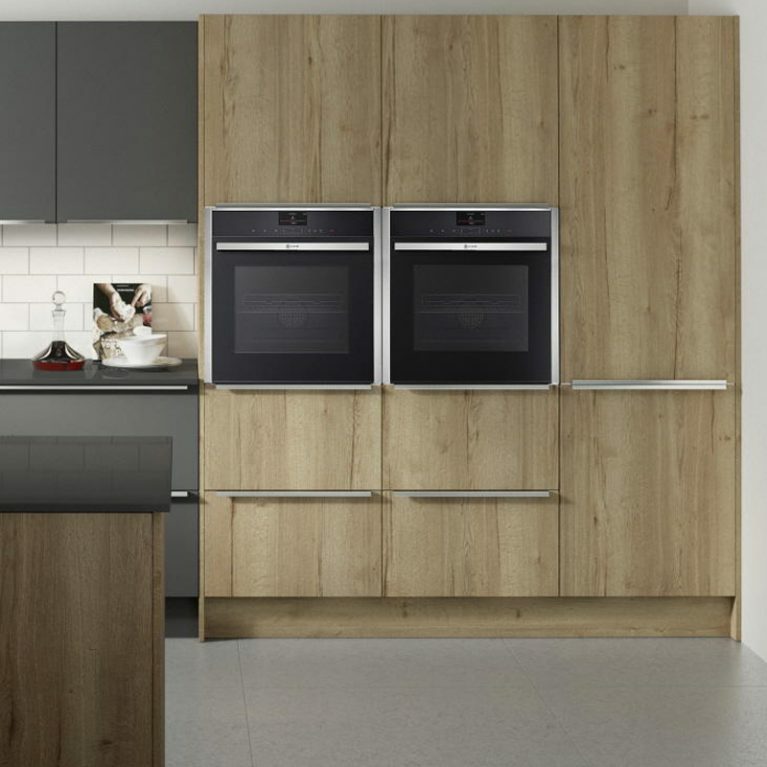 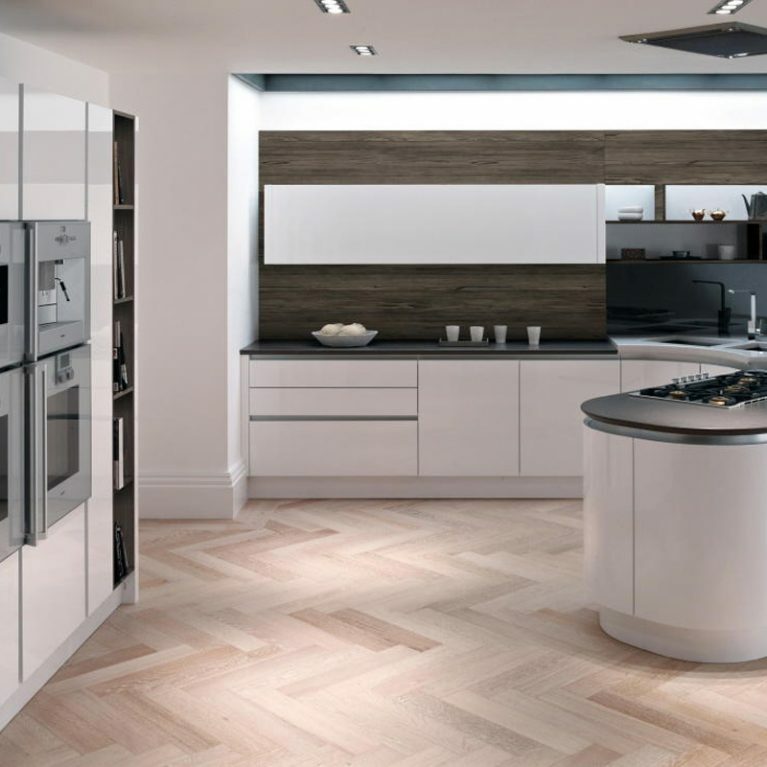 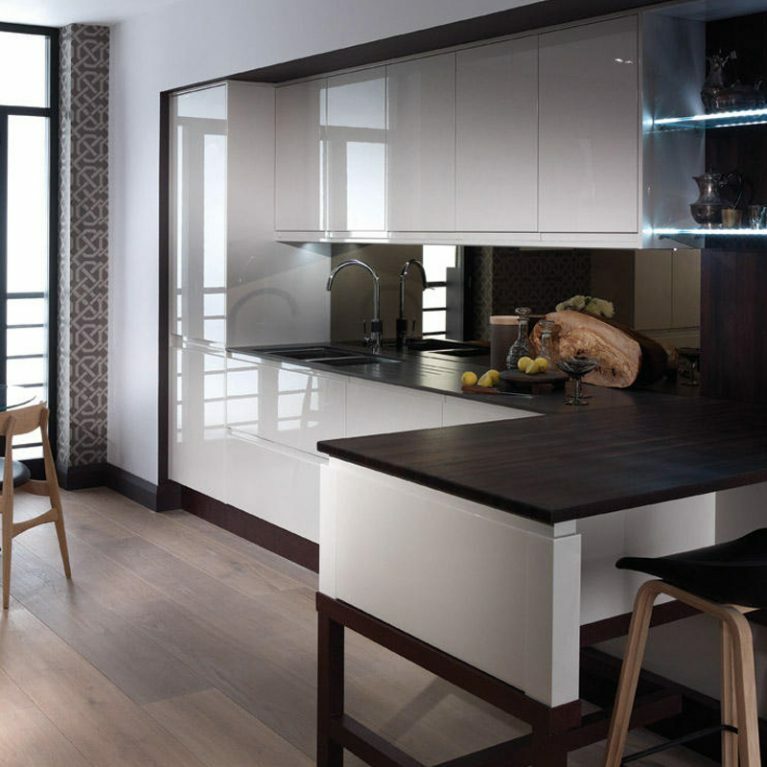 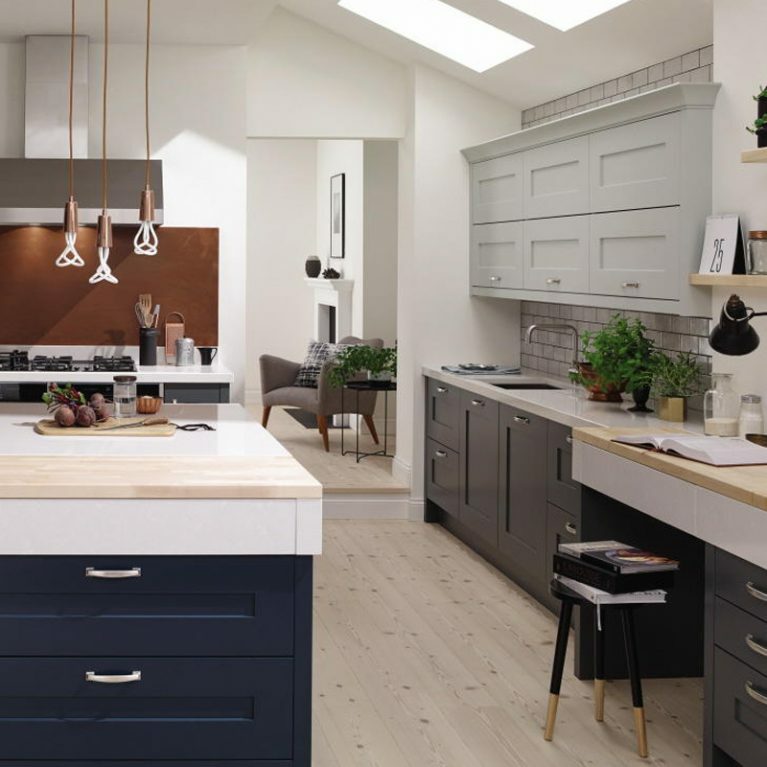 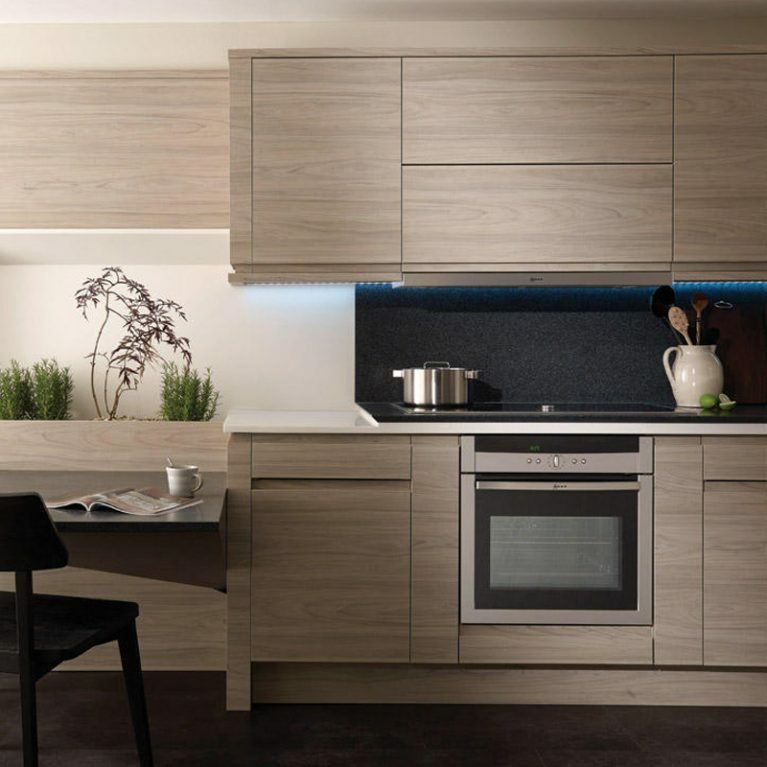 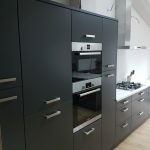 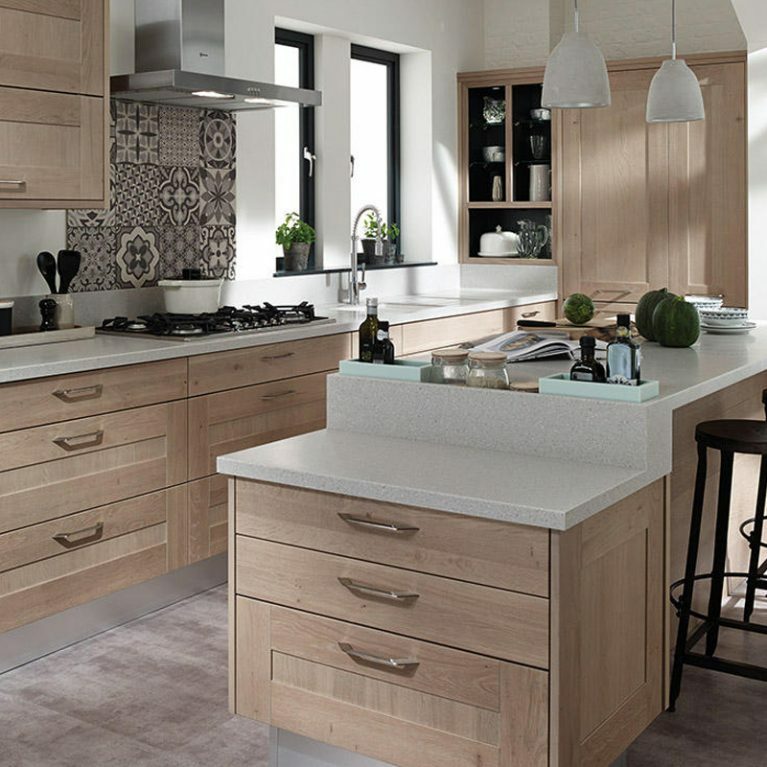 This beautiful wood-effect style is a wonderful foundation for your kitchen design, allowing you to choose a range of colours and finishes to compliment the oak in a way that suits your tastes. 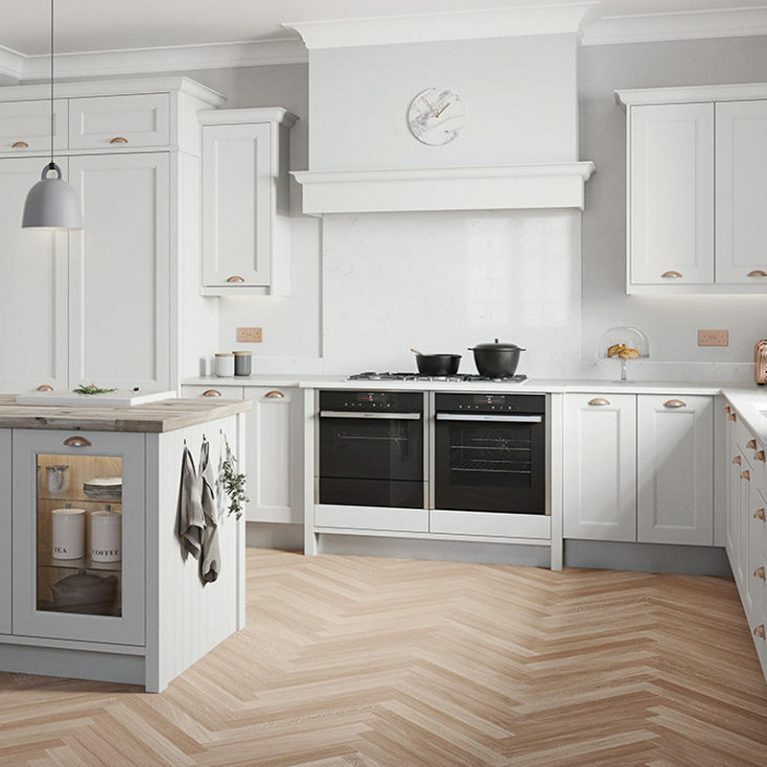 There are 27 matte colours for you to choose from to customise your Milbourne Oak classic curved wood kitchen, creating the colour palette of dreams for your Milbourne kitchen. 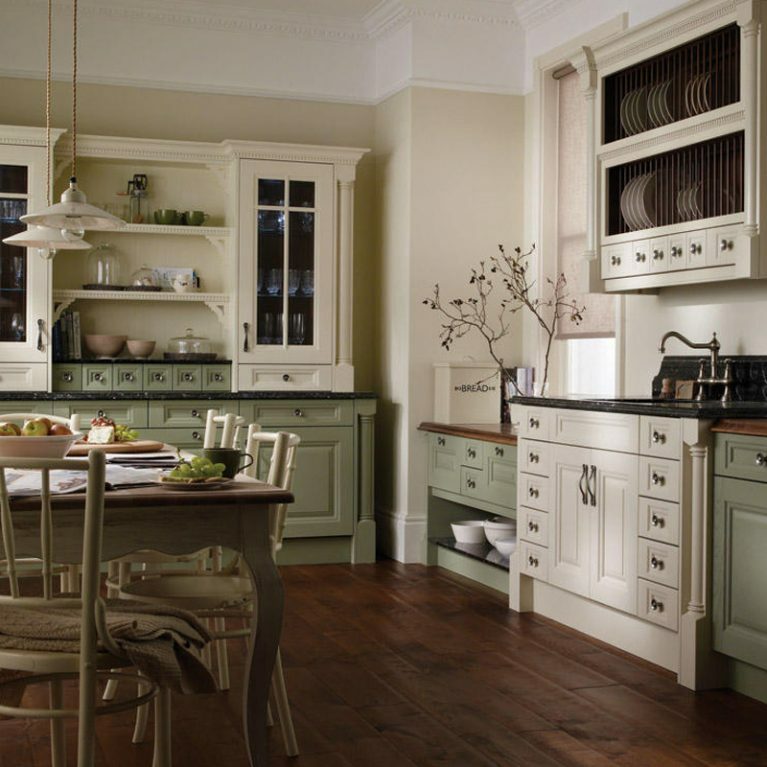 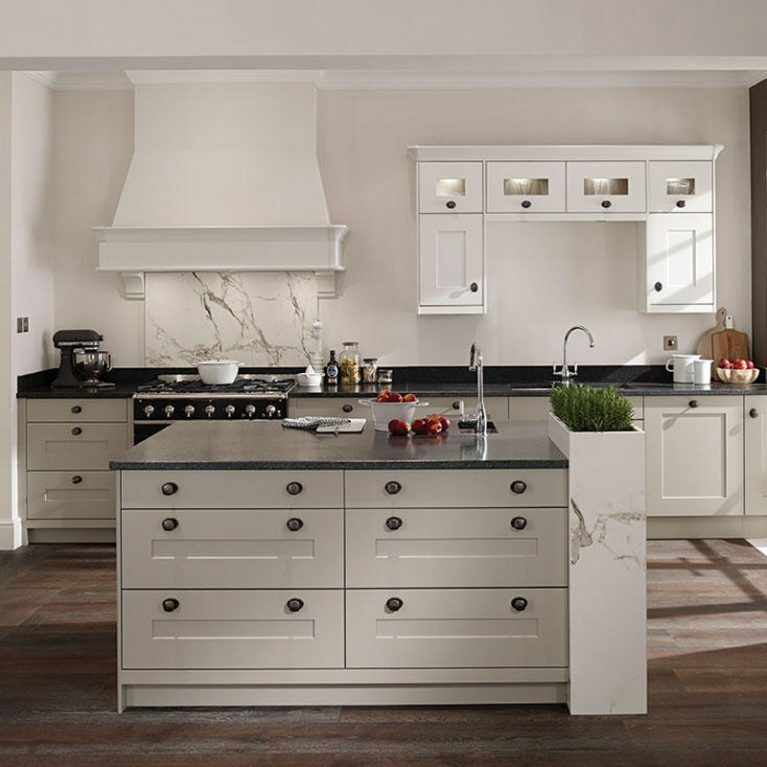 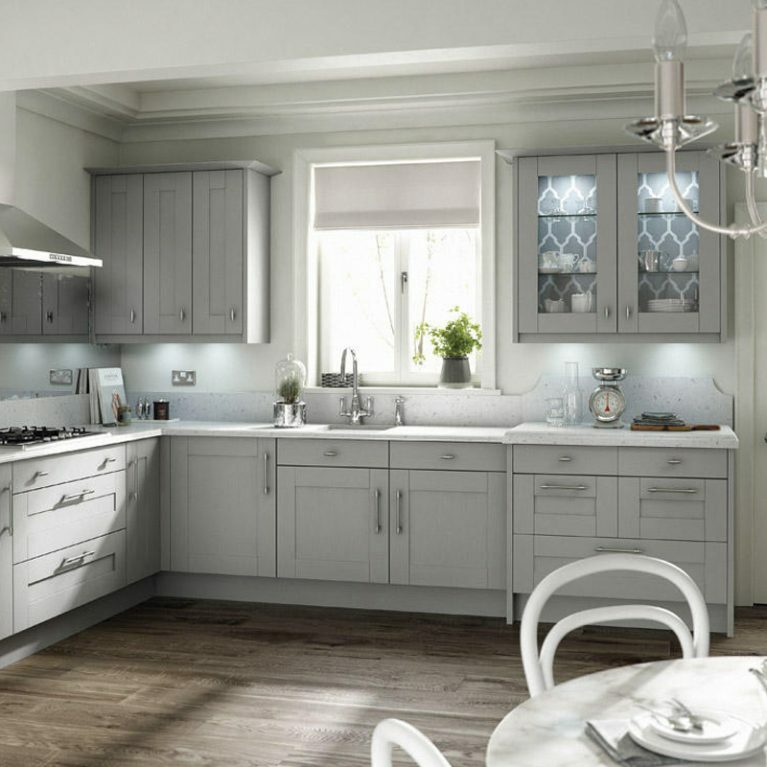 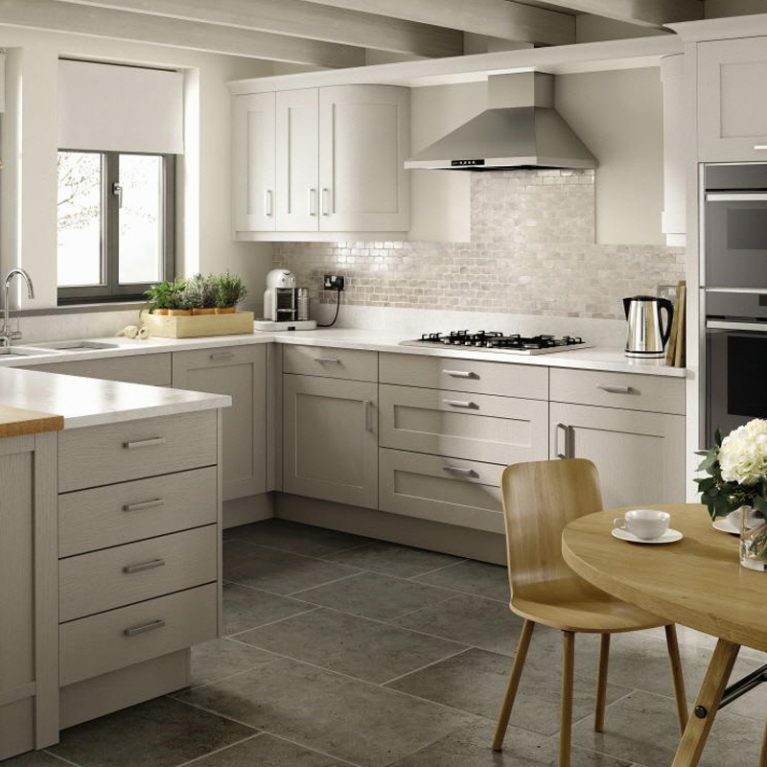 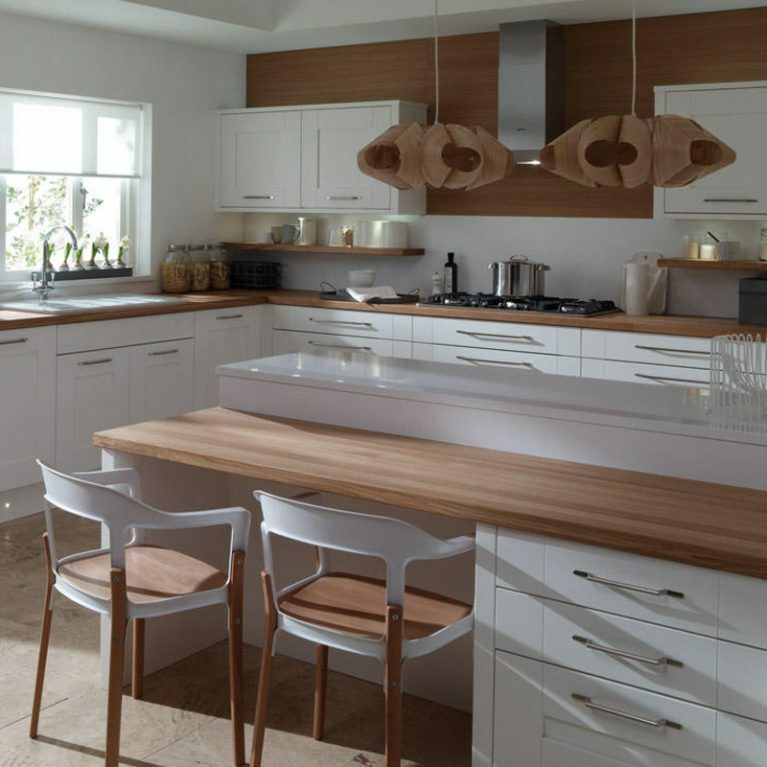 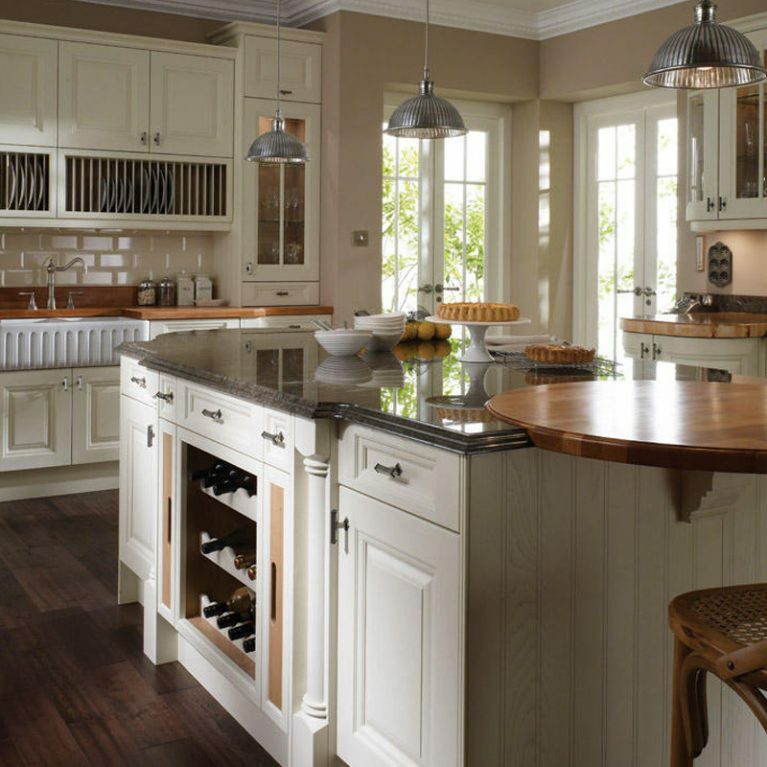 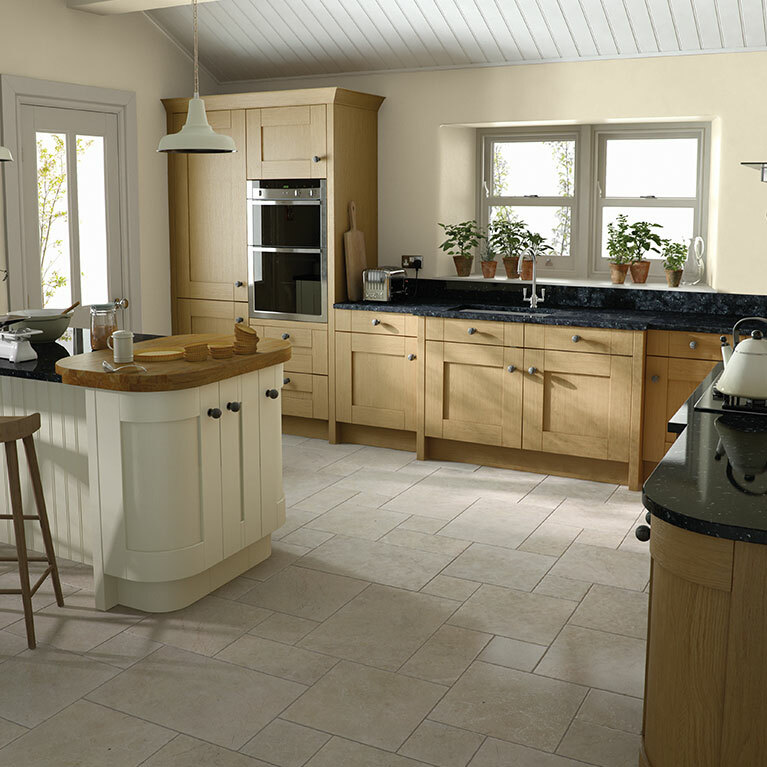 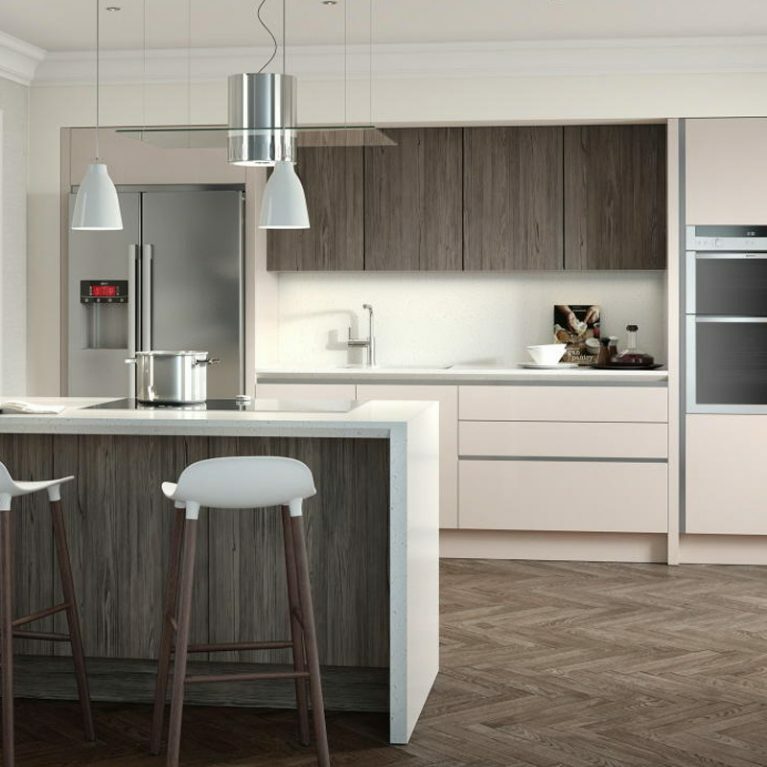 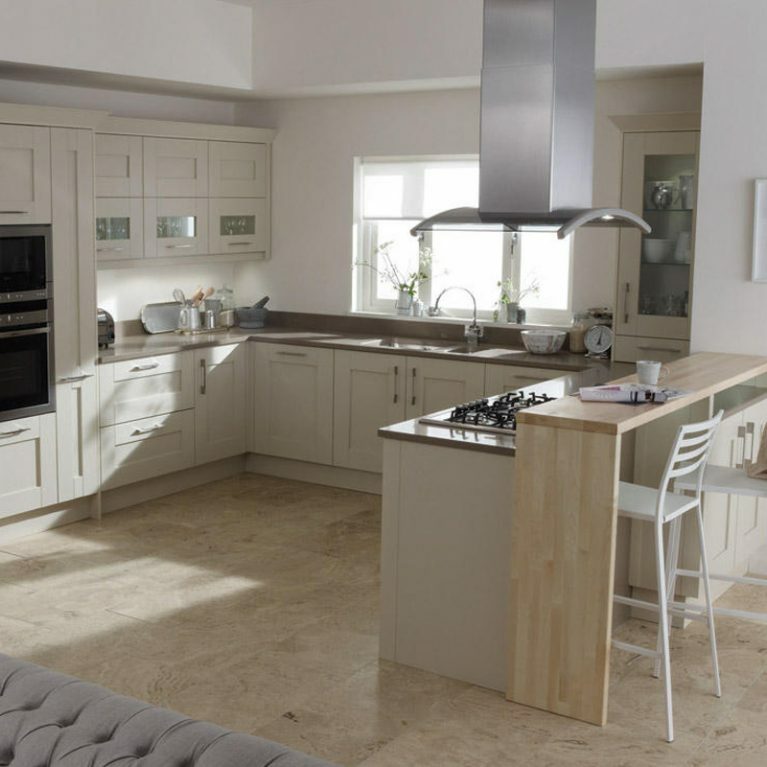 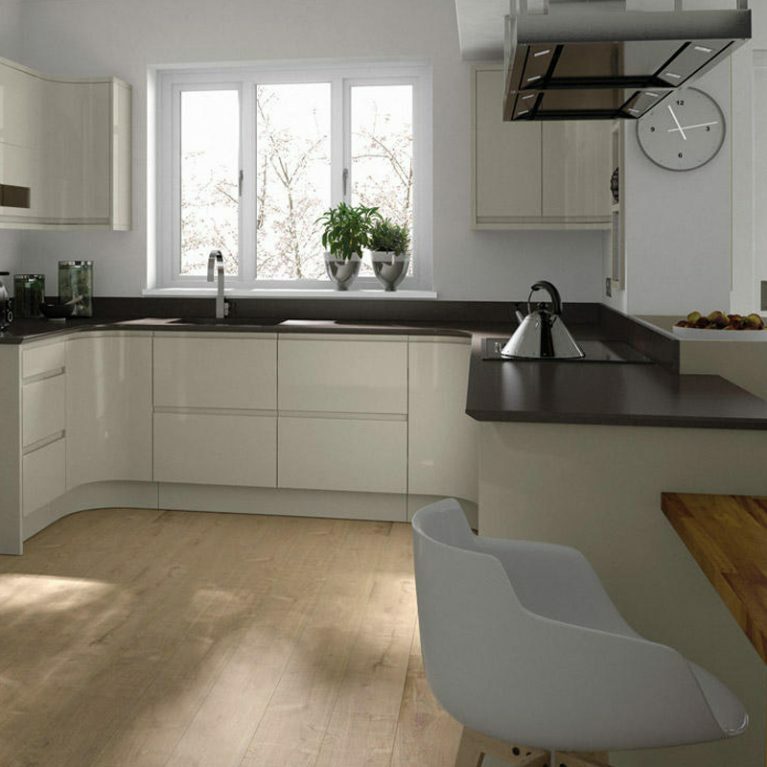 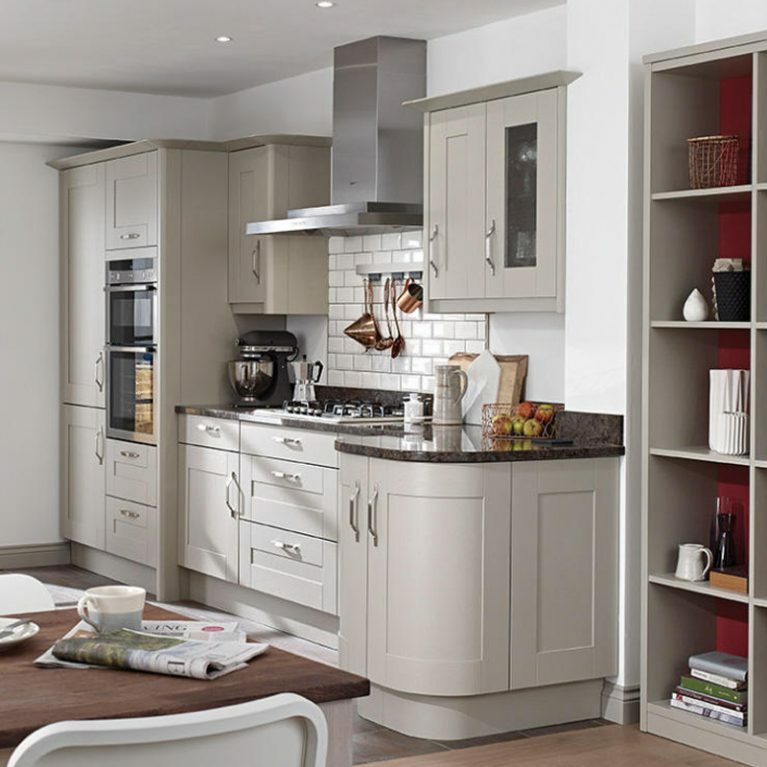 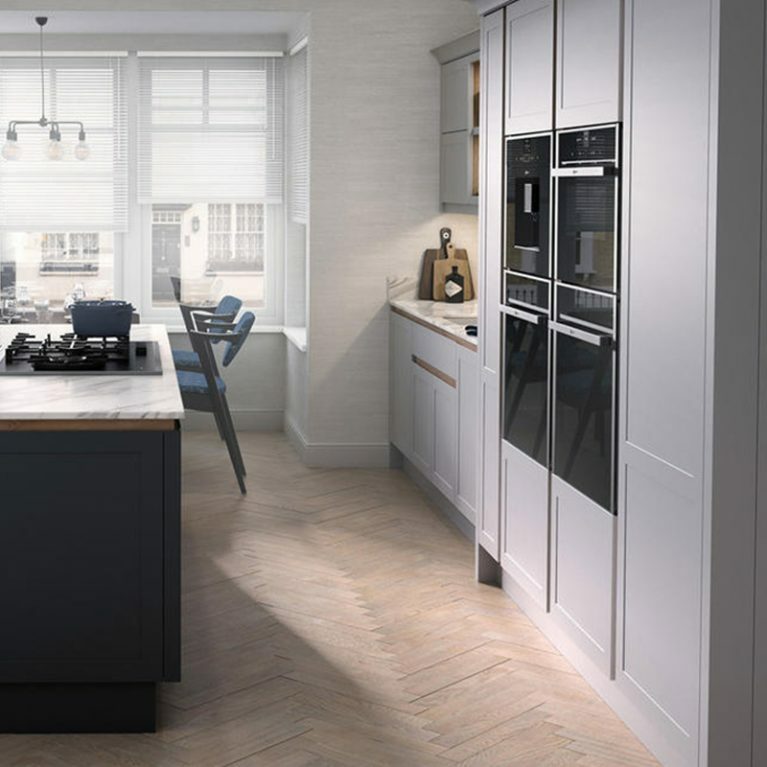 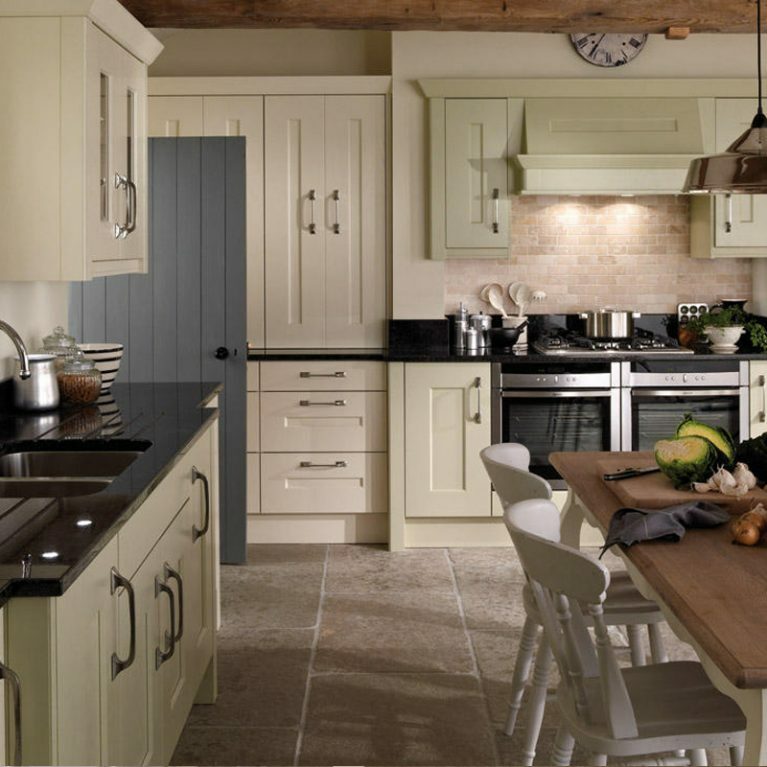 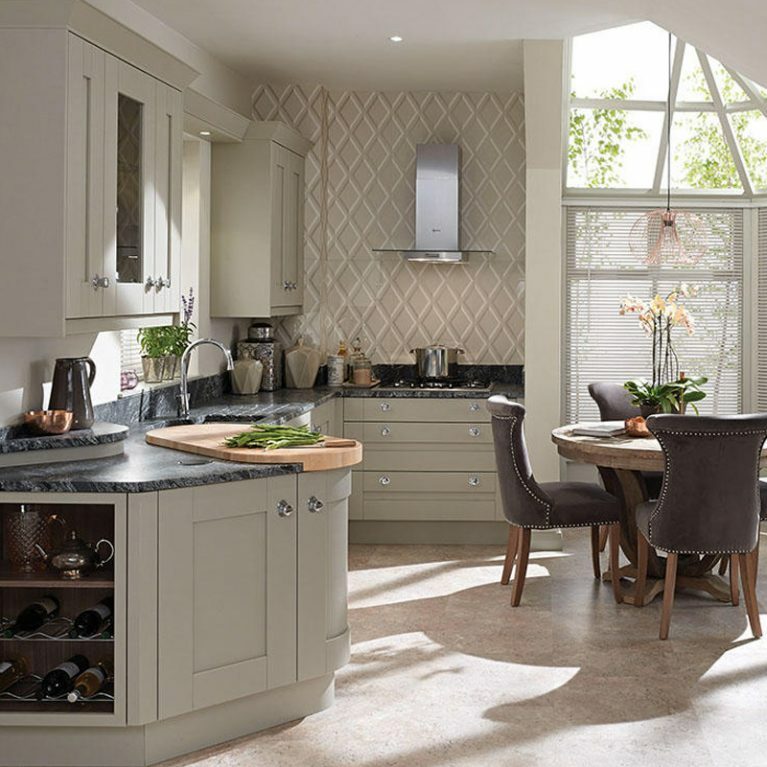 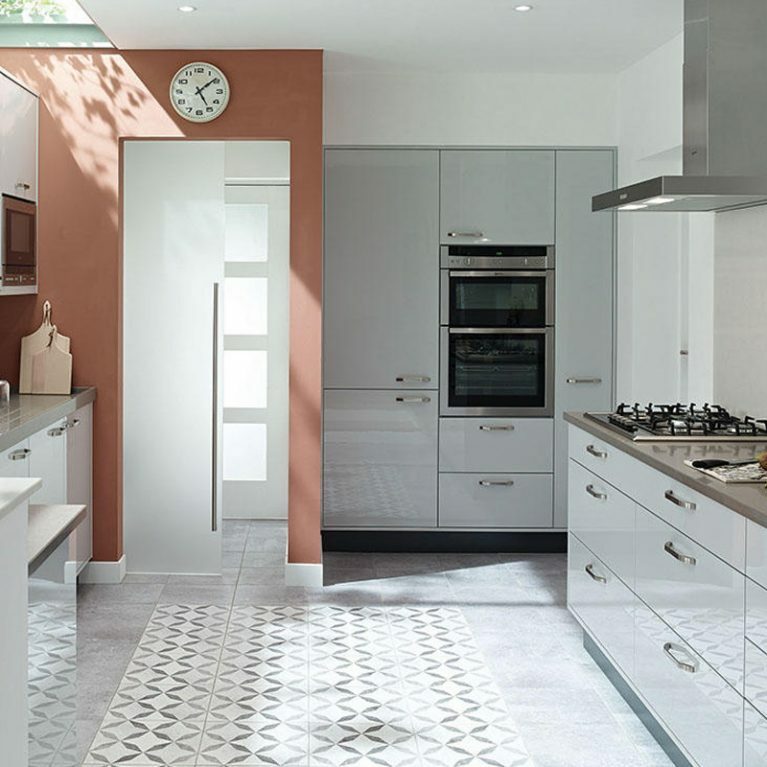 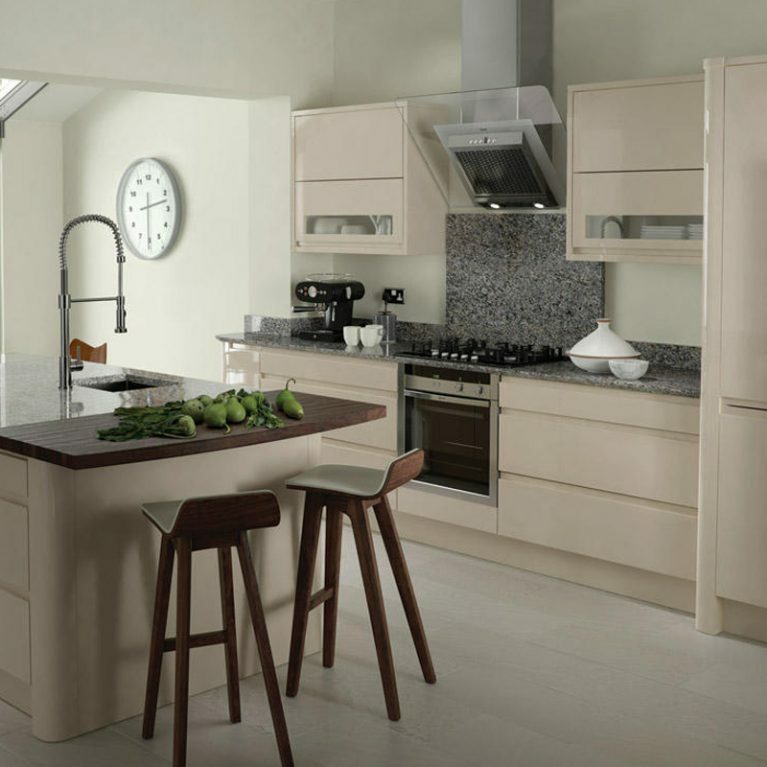 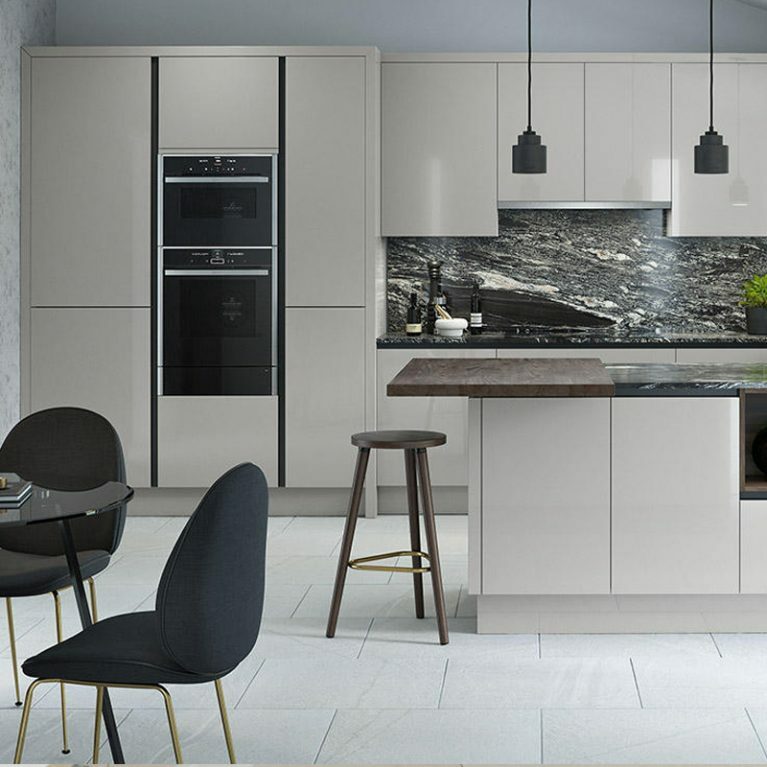 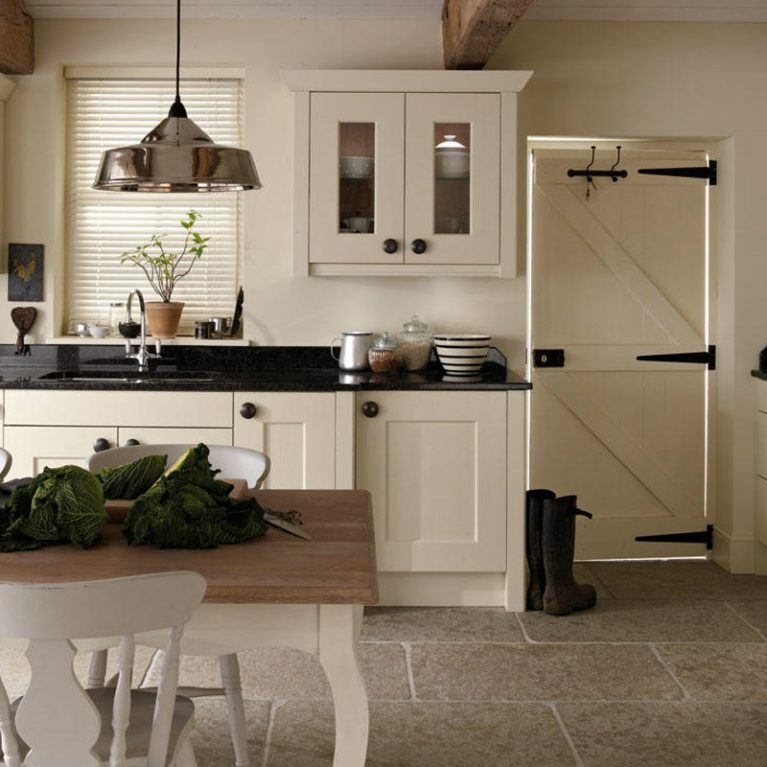 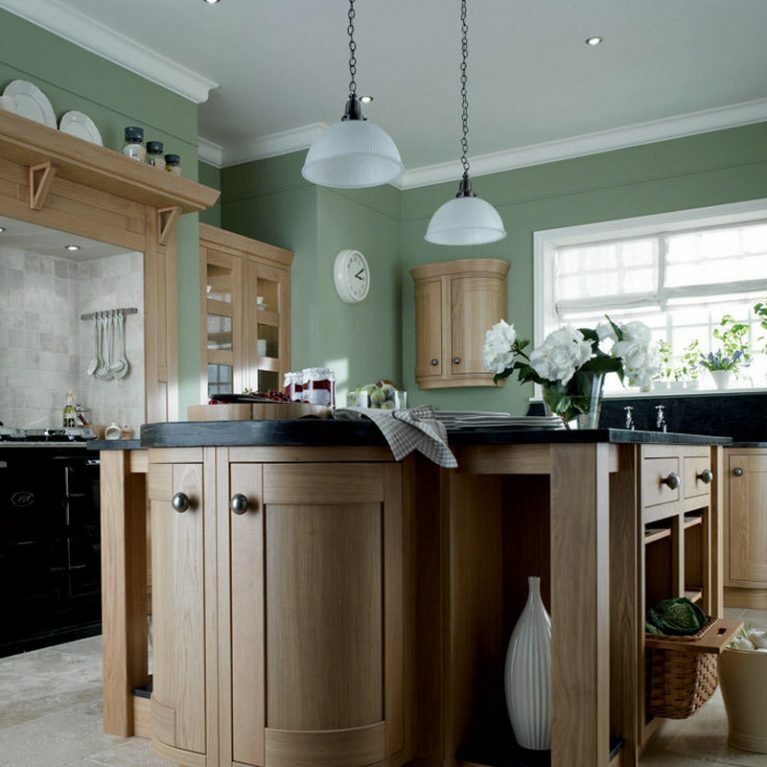 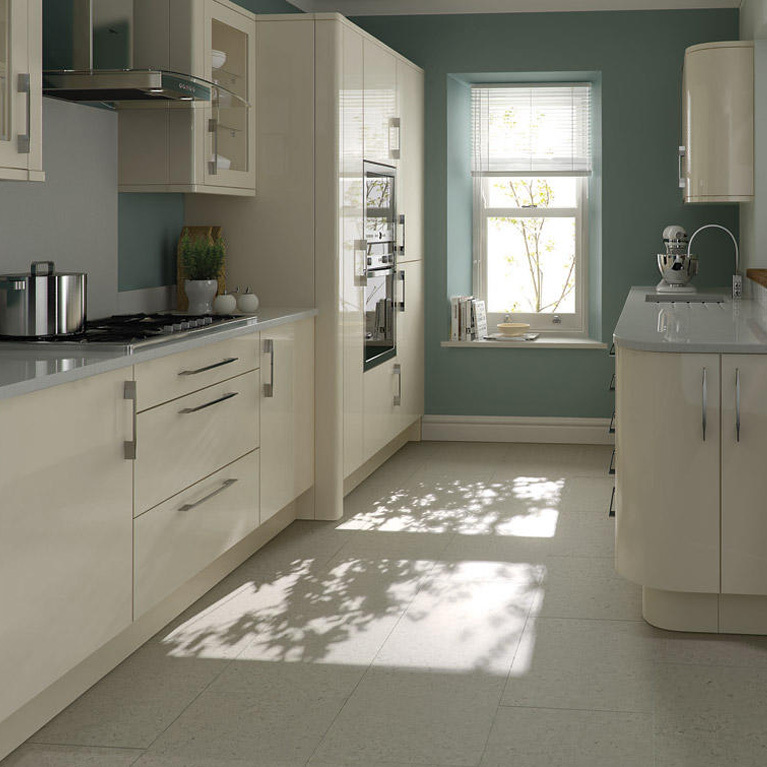 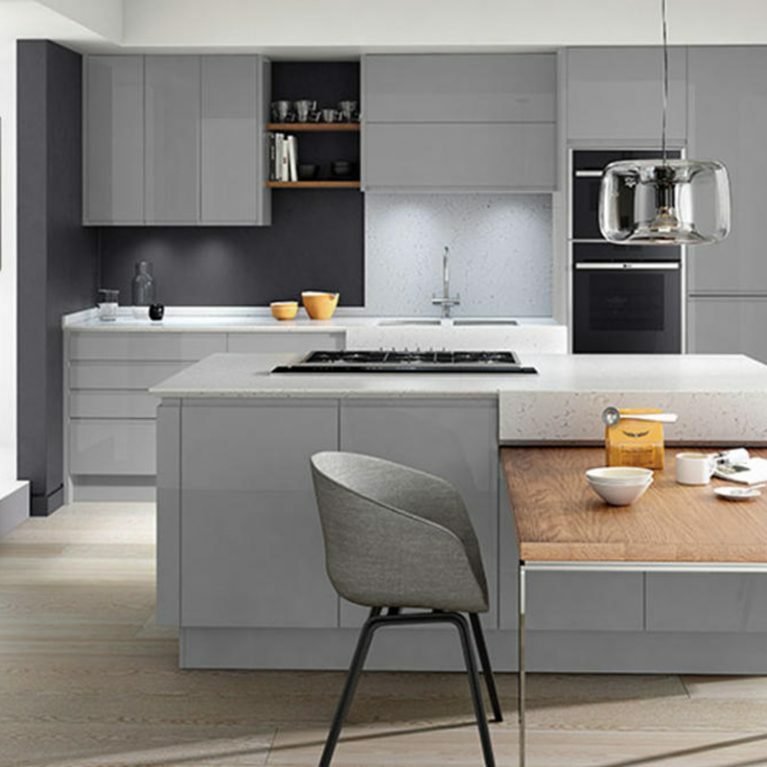 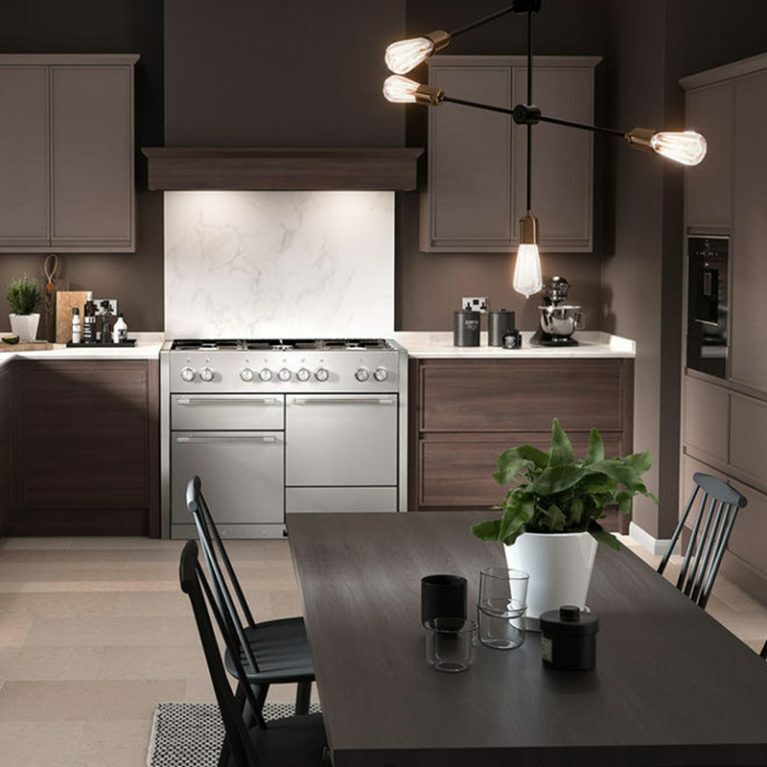 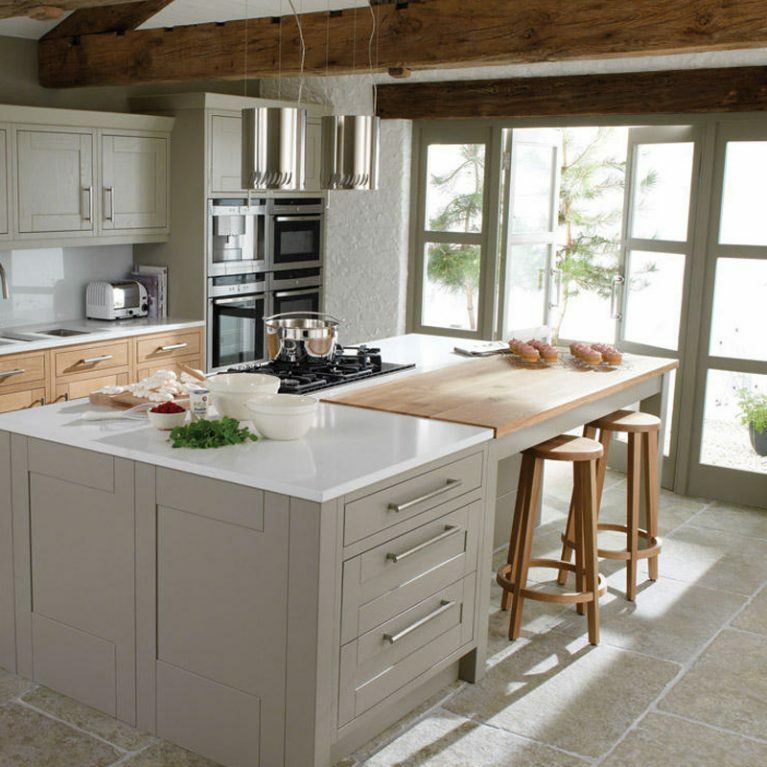 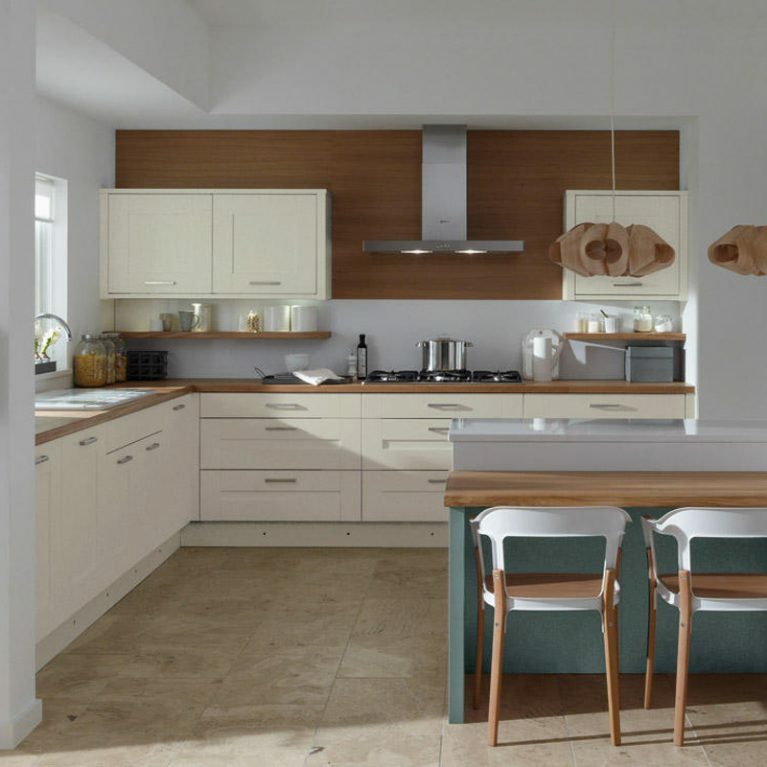 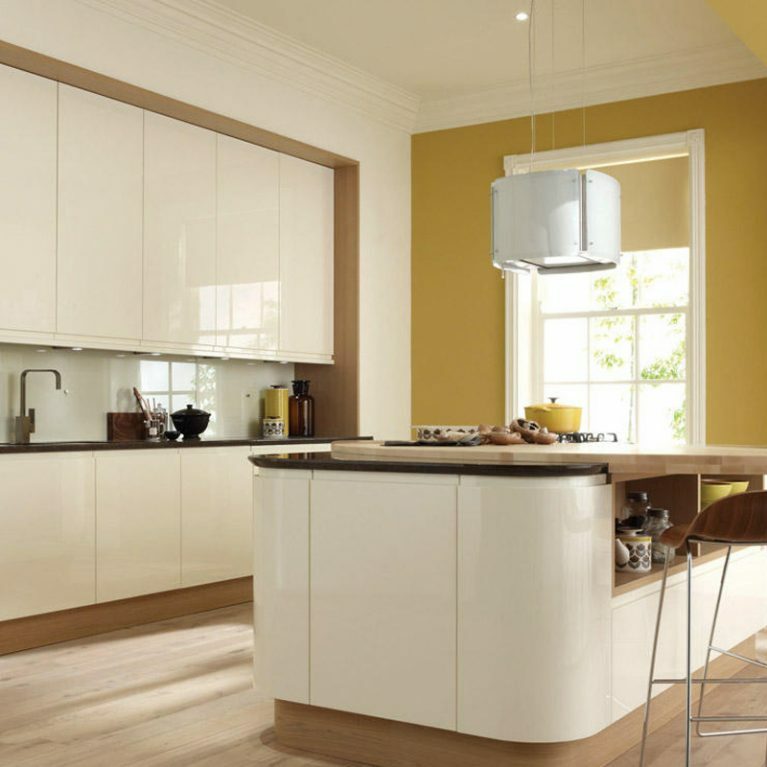 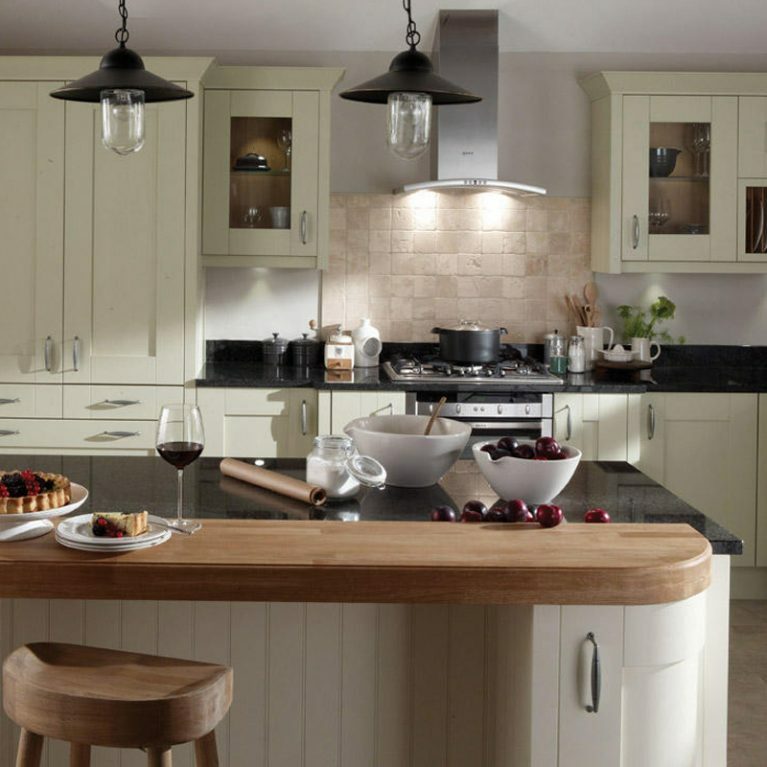 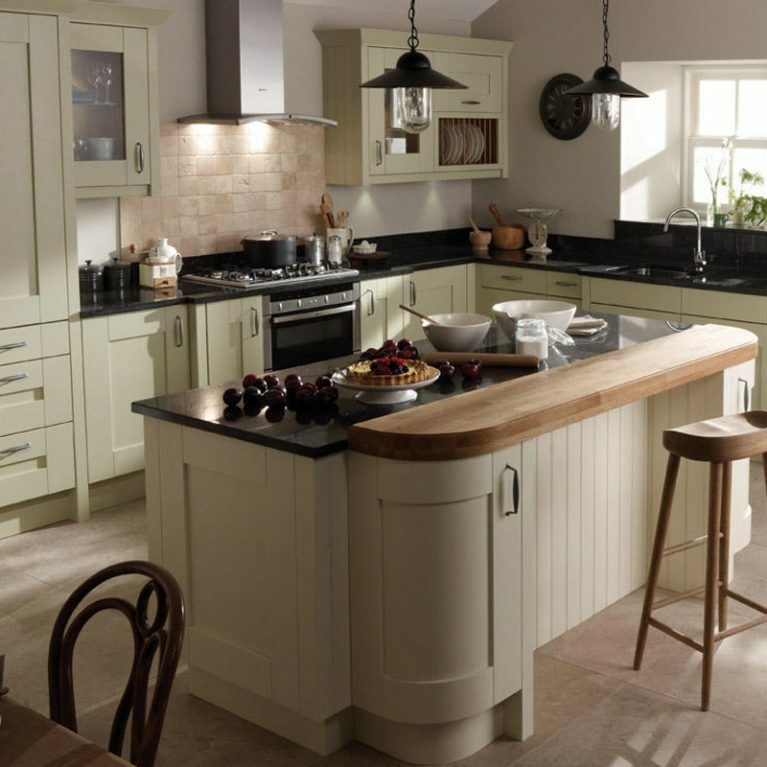 The kitchen peninsula featured in pictures is painted in the ‘Alabaster’ shade, which creates a gorgeous neutral combination with your oak Milbourne kitchen cupboards. 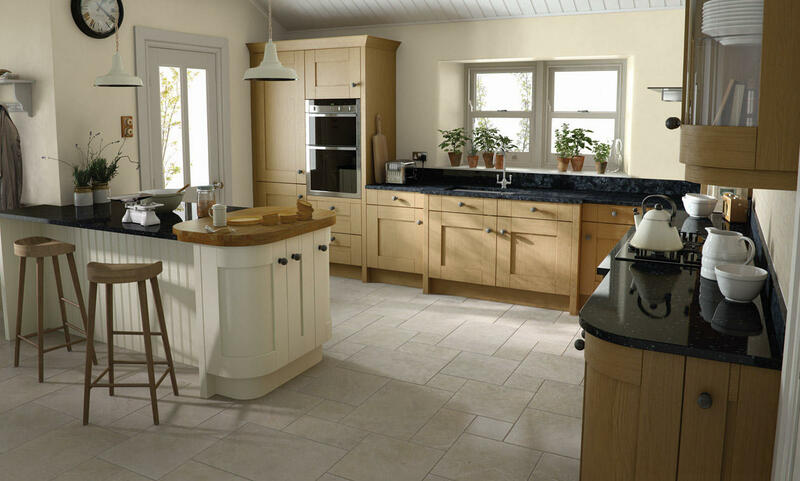 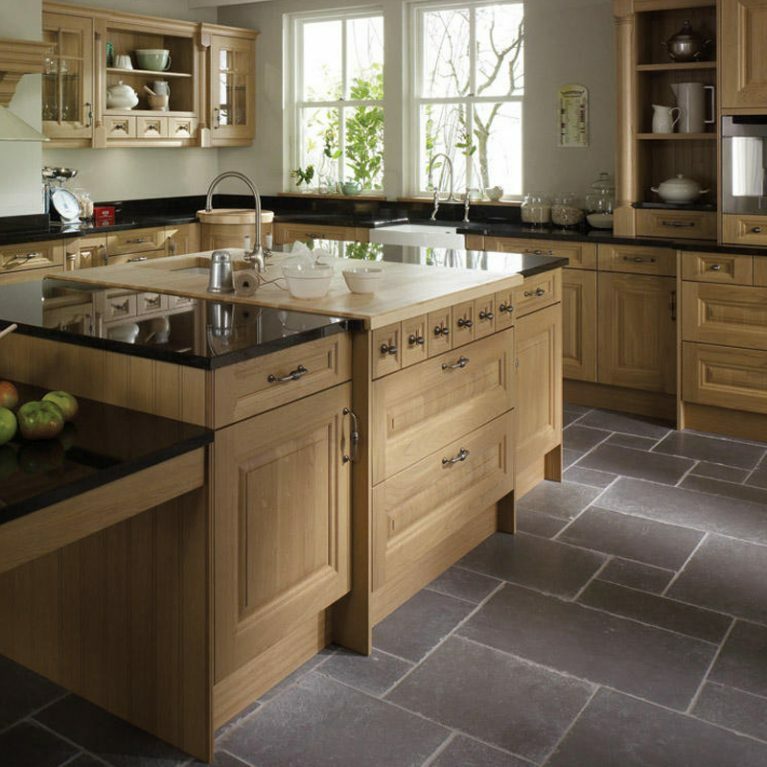 Our Milbourne Oak shaker doors are designed with a slightly textured finish, adding depth to the design and creating a beautiful look and feel for your kitchen. 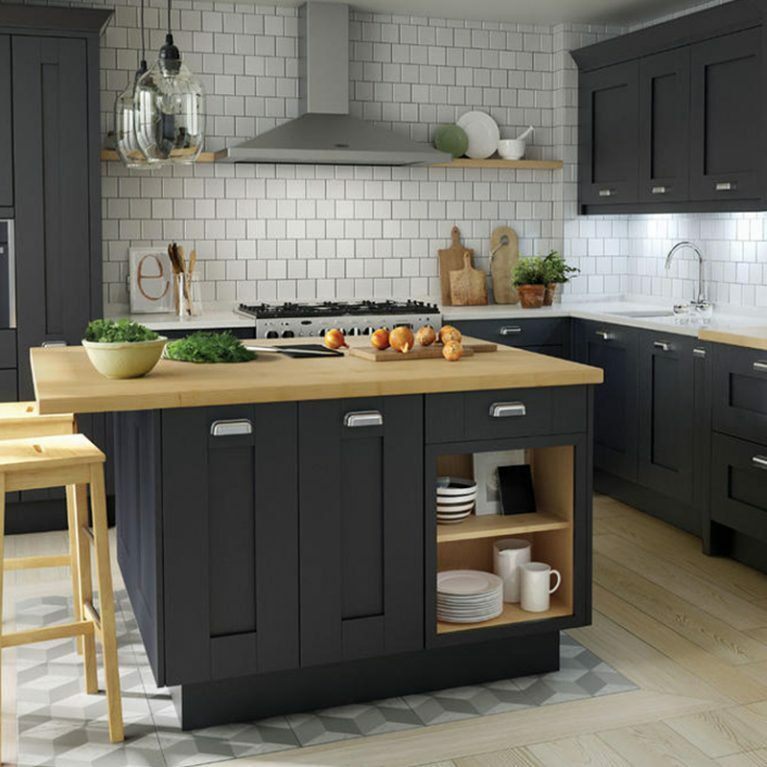 The beautiful glossy black work surfaces contrasts perfectly with the oak cupboard doors, creating a sleek and sophisticated finish. 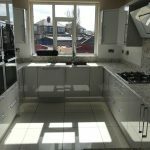 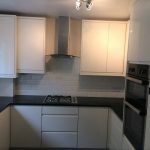 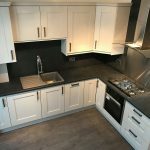 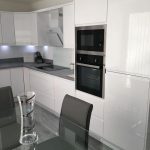 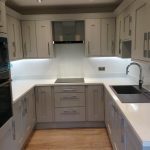 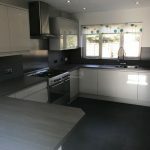 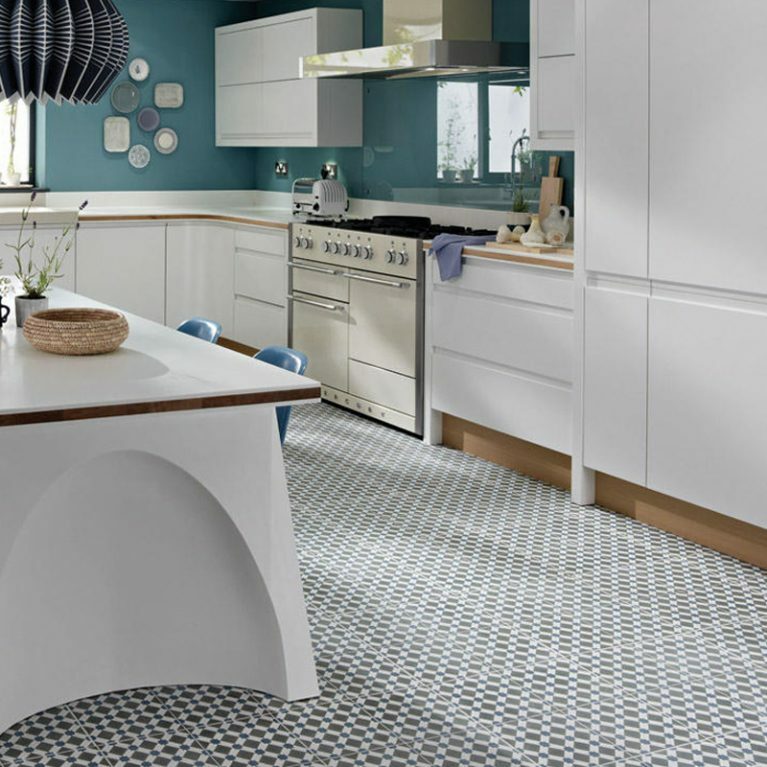 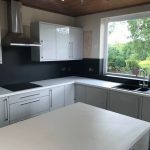 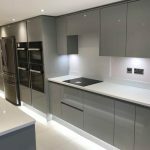 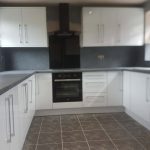 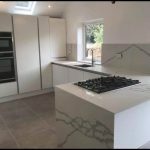 You can choose from a variety of different work surfaces as the ultimate finishing touch for your kitchen design, whatever your personal taste may be.